The California Public Utilities Commission may have hoped that the harsh headlines from PUC President Michael Peevey’s final year on the job would begin to fade after he left the position in December 2014. Instead, the state utilities regulator appears headed for a prolonged double whammy of bad news from both Northern and Southern California over decisions made during Peevey’s 12 years running the agency. In San Francisco, federal prosecutors are laying the groundwork for a criminal trial of Pacific Gas & Electric that will begin in March. In preliminary filings, prosecutors paint a scathing picture of PG&E negligence leading to the 2010 explosion of natural gas pipelines in San Bruno, which killed eight and wiped out a neighborhood. “The government intends to offer proof that PG&E’s willful decisions not to maintain records, conduct proper pipeline assessments, and otherwise comply with federal pipeline safety regulations were part of a corporate culture of prioritizing profits over safety,” federal prosecutors wrote in papers filed on Nov. 2 with the U.S. District Court in San Francisco. “They are trying to frame this case for a jury, and the government is attempting to frame this around a single word: greed,” Henning said. PG&E faces a fine of up to $1.13 billion if convicted on the federal criminal charges. Meanwhile, in Southern California, politicians and consumer advocates have grown increasingly critical of the PUC-orchestrated, already-approved plan to have ratepayers cover 70 percent of the $4.7 billion cost to close the San Onofre nuclear plant and safely shutter its two reactors, whose 2011 malfunctions led to the release of small amounts of radiation. Since the plan was approved in fall 2014, it’s been revealed that Peevey had never-disclosed meetings with Southern California Edison executives over how to apportion San Onofre closing costs, including a 2013 meeting in a Warsaw hotel room between Peevey and an Edison official. Edison owns 80 percent of San Onofre and San Diego Gas & Electric owns 20 percent. But other questions have emerged about the PUC’s stewardship that go beyond the propriety of these undisclosed meetings. The Los Angeles Times delved into the expert testimony that the PUC reviewed before approving the settlement and reported that one expert blamed Edison’s poor management for the problems with leaking steam generators which are used to cool the nuclear reactors and keep them safe to operate. The expert questioned the utility’s insistence on blaming Mitsubishi Heavy Industries, the branch of the Japanese conglomerate that made and installed the generators. Arnie Gundersen, a nuclear engineer who served as an expert witness regarding the handling of San Onofre’s generators, said at a minimum both Edison and Mitsubishi are at fault. “When I reviewed all the data it was clear to me that Southern California Edison was the one driving the bus,” Gundersen said. 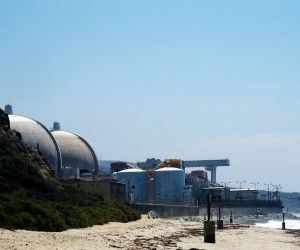 Gundersen said the San Onofre case is similar to two incidents in Florida, where an agreement was reached over the closed Crystal River nuclear plant that led to billions in costs to consumers. In addition, he said, the St. Lucie nuclear plant had similar steam generator problems as San Onofre. A KPBS report also alleged that Edison acted deceptively in its 2006 meeting with the Nuclear Regulatory Commission, never telling NRC officials of concerns about the steam generators that let Edison to complain to Mitsubishi in both 2004 and 2005. It appears the PUC was unaware that the utility’s concerns about steam generator problems dated to 2004. A San Diego Union-Tribune analysis also raised questions about the PUC negotiations that led to the agreement assigning most of the shutdown costs to ratepayers. The biggest beneficiary of a state program aimed at leveling the playing field between utilities and their customers is a Bay Area consumer group that privately negotiated the deal assigning customers 70 percent of the costs for the failure of the San Onofre nuclear plant. TURN receives as much as 90 percent of its operating income from commission awards, so it’s highly dependent on regulators for its livelihood. Whether consciously or not, the group might allow that dependency to shape its advocacy, critics say. Peevey is facing criminal investigations by both the state and federal government. His home in La Cañada Flintridge, a Los Angeles suburb, was searched by investigators in January.